The bags have reinforced handles. A small patch of polythene is placed behind the handle location during manufacture so that when the handle hole is punched out, the surrounding LDPE or HDPE is supported by an extra layer of usually clear polythene. This adds far great strength around this area and allows the carrier bag to be used for longer periods and carry more weight. Without the patch insert, the handle area tends to be one of the weaker spots on a carrier bag as when in use correctly, the handle will have to support all of the contents of the carrier bag. The example shown here is for a drink promotion in Africa. Printed 3 colours, both sides, with 90% ink coverage. The bags are usually packed in out card boxes in quantities of 500 or 1,000. Deliveries can be made to any location around the UK or exported too. Beckdale can assist with all artwork and design processes of all carrier bags. A sample bag is not possible on this style of bag due to the machine set up requirements. Our Company assist in the creation of custom patch handle polythene bags. 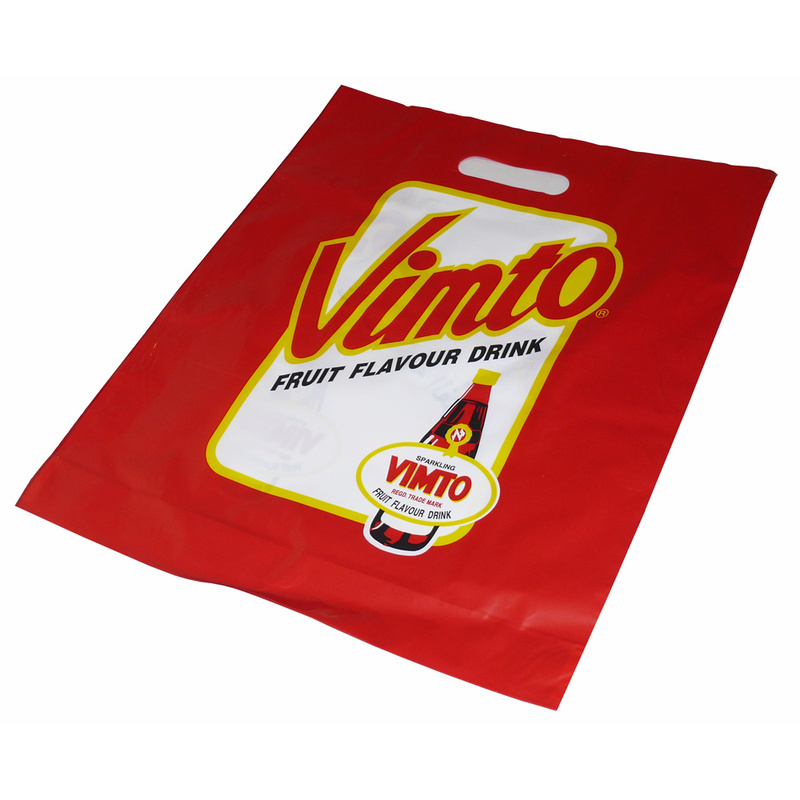 Our design team assist throughout, helping purchasers choose tailored patch handle polythene bags. To obtain choose by material or similar , contact our offices via the above details.